Advanced Document Systems & Supply Inc. carries a wide selection of binding covers, clear covers, and report covers to help enhance and protect all your presentations and printed materials. 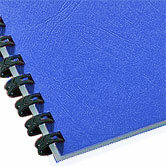 These binding covers are available in many styles and colors offering the user multiple options for complimenting existing marketing and branding efforts. In addition, with our custom printing services, we can print your company name, logo, or branding message on your binding covers. This top quality printing lends a distinctive and elegant overall look to your reports, proposals, and documents. 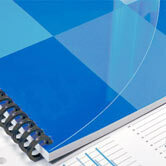 Some of our document covers are stock sizes; others are available in custom sizes. We offer binding covers in many different weights and sizes, including clear covers, sturdy grain covers, and composition covers. Clear covers are available in sizes 8-1/2" x 11" up to 11" x 17", with either square or rounded corners; thicknesses vary from 5 mil up to 10 mil. Composition covers are made from heavy (17 pt.) latex-coated paper with an embossed grain pattern. Many colors and sizes are available. Linen document covers are made from 80# cover stock with an embossed linen pattern. 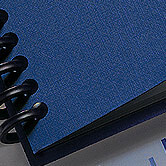 Sturdy grain document covers are made from a light weight (80#) cover stock with an embossed leather-like grain pattern. Many sizes, including custom sizes, are available. Looking to personalize your presentations with your company logo and colors? 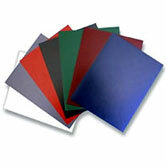 We offer customizing services on a variety of cover stock and colors. 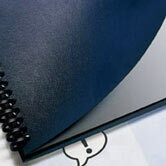 Please browse our Custom Products section for more information about custom document covers. We offer an extensive catalog of additional paper handling products including paper folders, corner rounders, paper drills, 3-hole punches, and more. We also carry top-of-the-line Laminating and Binding Machines. Contact our knowledgeable staff today for the widest selection, lowest prices, and unsurpassed service on all types of binding machines and supplies: 800.808.2377.